It should work with future Motorola Z-series flagships, too. 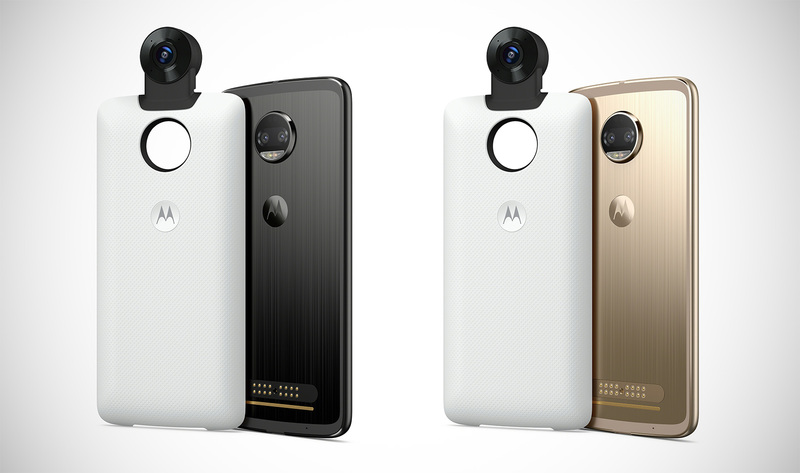 This isn't the first photographic Moto Mod ever — that would be the Hasselblad Zoom attachment — but this one seems tailor-made to capitalize on the rise of VR headsets. (Coincidentally, this thing looks a lot like immersive camera add-on for Andy Rubin's Essential phone.) Two 13-megapixel sensors do all the heavy lifting here, and they're capable of capturing 150-degree wide-angle shots when you're only using one at a time. As with other 360-degree cameras, like Samsung's updated Gear 360, you'll also be able to stream these live views directly to your social network of choice (though we're still waiting for Motorola to release the full list of compatible services). Also like the Gear 360, you'll do the lion's share of the editing right on the phone, which isn't a surprise since, you know, the camera is physically attached to it. And really, that physical connection is the most fascinating thing about the 360 camera. Since Motorola decided to build this camera into a magnetic Mod instead of its own standalone body, it draws power straight from the phone's battery — too bad the Moto Z2 Force has a smaller battery than we would've liked. Exactly how much power this thing drains while attached remains a mystery, though — we'll ask the higher-ups just as soon as this press conference winds down.